I discovered ‘The Gates’ by John Connolly during a bookstore browsing session last week. I wanted to put it back on the shelf, but the description of the book on the back cover and the first page of the book grabbed my attention and refused to let me go. I finished reading it recently (I like the fact that in recent times, I am reading books as soon as I get them J). Here is what I think. Samuel Johnson is a young boy who lives in the village of Biddlecombe with his single mother and his dog called James Boswell. When Samuel Johnson tries to go ‘trick-and-treating’ in advance, one day before Halloween, to the place of his neighbour, the Abernathys, he discovers that the Abernathys and their friends the Renfields are in the middle of strange ritual in their basement. At the same time something strange happens in the Large Hadron Collider (LHC) which is running in Switzerland. Stranger things happen at the Abernathys’ basement, where there is an explosion and some strange creatures come out of a bluish flame in the middle of the basement and take over the bodies of the Abernathys and the Renfields. Johnson later learns that the Abernathys and their friends were trying to perform an ancient ritual to open the gates of Hell. Johnson speeds off to home after this incident, but not before the creature which inhabits Mrs.Abernathy has seen him. She makes him realize that in subsequent meetings and Johnson knows that he is in danger. Meanwhile by accident, the demon Nurd, who has been banished to a remote part of Hell by the Devil himself, is mysteriously transported across dimensions and ends up in the real world and meets Samuel. For a first encounter between a demon and a human boy, the meeting goes off quite well and Nurd seems to enjoy the little pleasures of the world and the company of humans, while Johnson finds that demons could be pleasant and fun too. Soon Johnson enlists the help of his friends Maria and Tom to fight the creatures in the Abernathys’ basement. Strange things start happening in the village of Biddlecombe and strange creatures start coming out of the house of the Abernathys and create havoc. How Johnson and his friends and his dog Boswell and how the scientists in CERN tackle this and the role the demon Nurd plays in this and whether the devil is actually able to open the gates of Hell and get to earth form the rest of the story. I loved ‘The Gates’. It has a combination of fantasy, science, mythology and is fast-paced. There is wonderful humour in every page and in the first half of the story, there are footnotes in atleast every alternate page. Sometimes the footnotes add explanations to some aspect of the story or to the science, literature, language part of it. At other times the footnotes are humorous entries which make one laugh out loud. I liked most of the main characters – Samuel Johnson, his dog James Boswell, his friends Maria and Tom – but my most favourite character in the story was the demon Nurd. Nurd was cool, liked having fun, enjoyed new experiences like having wine gums or driving fast cars and generally added a spark to the story. He also played an important role in the climax. This book reminded me of ‘The Amulet of Samarkhand’ by Jonathan Stroud, because of its humour and because one of its main characters is a demon (‘The Amulet of Samarkhand’ had a djinn as one of the main characters). The subtitle of the book read ‘Samuel Johnson Versus The Devil : Round 1’. I heard that the second book of the series is also out. I cannot wait to read that next and find out what happens in Round 2. Having read a few Irish authors – Eoin Colfer, Erskine Childers, John Banville and little bits of Seamus Heaney, Cecilia Ahern, John McGahern – and now John Connolly, I have to say that Irish literature rocks! I also read in Wikipedia that John Connolly also writes crime novels. If ‘The Gates’ is anything to go by, I think his crime novels would be fun too. I want to explore them sometime. This is one of my favourite footnotes. The Divine Comedy is not funny, but it’s not supposed to be, despite its name. In Dante’s time, a comedy meant a work that reflected a belief in an ordered universe. Also, serious books were written in Latin, and Dante wrote in a new language : Italian. Some of Shakespeare’s comedies are funny, though, but not if you’re being forced to study them in school. In school, everything Shakespeare wrote starts to seem like a tragedy, even the ones that aren’t tragedies, which is a bit unfortunate, but that’s just because of the way they’re taught. Stick with them. In later life, people will be impressed that you can quote Shakespeare, and you will sound very intelligent. It’s harder to quote trigonometry, or quadratic equations, and not half as romantic. Here are some of my favourite passages on Nurd, the demon. Samuel had a good instinct for people. He could tell a good person from a bad one, often before the person in question had even spoken. Although his experience of demons was rather more limited, something told him that if Nurd wasn’t exactly good – and, being a demon, it was hardly part of the job description (‘Wanted : demon. Must be good…’) – he was not entirely bad either. Like most ordinary people, he was just himself. ‘You’re not going to hurt me, are you?’ asked Samuel. And Nurd, who had never had a mother and father, and who had never loved or been loved, marvelled at the ways in which feeling so wonderful could also leave one open to so much pain. In a strange way, he envied Samuel even that. He wanted to care about someone so much that it could hurt. Have you read ‘The Gates’? What do you think about it? What an interesting sounding book – I hadn’t heard of it or the author previously but it sounds like a lot of fun. It was very humorous and a pleasure to read, Amy. I haven’t read this, but Connolly’s The Book of Lost Things was one of my favourites of the year when I read it. I’d strongly recommend that to you – a wonderful combination of fairy tales, horror, and coming-of-age. Thanks for mentioning Connolly’s ‘The Book of Lost Things’, Ana. I want to read that now 🙂 If you do get to read ‘The Gates’ I would love to hear your thoughts on it. Demons, hell and devils.. quite a look of evil there! Not sure if it is for me but thanks for the review. Inspite of the seemingly ‘dark’ subject matter, this book is quite funny and humorous, Jo. If you do get to read it, I would love to hear your thoughts on it. Tony and I tried to read this aloud to one another a few years back and failed miserably. I think it probably would be a great book to read to yourself (obviously you enjoyed it! ), but because it had so many footnotes and the sentences had so many asides, we found it hard to really appreciate when we weren’t the ones reading it. I did really enjoy one of Connolly’s other books, The Book of Lost Things, that I read ages ago, so I may have to dig this one out and give it another try! Interesting to know that you and Tony tried reading this book aloud, Steph. Sorry to know that it didn’t work for you at that time. But hope you give it a try again. It is humorous and wonderful and I haven’t read footnotes which are so humorous before 🙂 Thanks for mentioning ‘The Book of Lost Things’. I want to read that now. I loved the British humor in this one, and Nurd of course. And my edition has such a great cover (the reason I picked it up in the first place 😉 ). Hope the second one is as great. Glad to know that you like the look of this book, Stu 🙂 If you do get to read it, I would love to hear your thoughts. I don’t tend to like footnotes very much in fiction – I find they often break up the flow, which is perhaps the intention, but I prefer just to follow the story. Having said that, humorous ones are probably better 🙂 Thanks for introducing me to another writer and book I’d never heard of before! I agree with you, Andrew – footnotes do tend to break the flow of the story. In this book though, footnotes are mostly fun elements and they add to the humour of the story. If you do get to read this book, I would love to hear your thoughts on it. 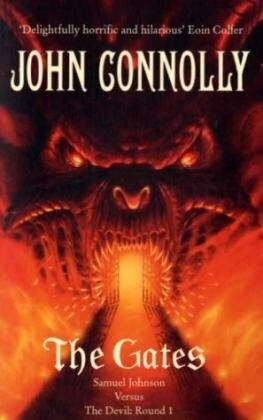 The only thing by John Connolly that I’ve read is The Book of Lost Things. It didn’t strike me so deeply that I can remember things to say here; I guess I can say I didn’t really like it. But, that puts me in a huge minoritiy. Most people I know loved it.